Earlier this year, Metro's Technical Assistance Center on Disproportionality (TAC-D) partnered with the New York City Department of Education (NYCDOE) Field Support Centers (FSC) to form the Youth Technical Assistance Center On Addressing Disproportionality. The Metro program is the first of its kind since TAC-D was created several decades ago. The aim of YTAC-D is to inform practitioners of how youth experience disproportionality as the program works towards creating a more equitable schooling experience for all students. The YTAC-D leaders use the framework of Paulo Freire to bring adults and youth to the table to do the important work in disrupting educational disparities among youth in our schools. 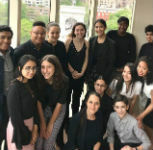 The youth participants in Metro's program are New York City high school students representing all seven NYC boroughs. The participants meet monthly. They will examine strategies and practices that move program leaders toward a more youth centered program in the schools. The program is facilitated by Metro Research Assistant Hui-ling Malone, in conjunction with project associates of Metro's TAC-D program and NYCDOE partners from the NYDOE Field Support Centers, Emilie Mittiga, Ari Sussman and LaChelle Gaillard.